I absolutely adore summer, and though we may be approaching the end of it for the year, I'm not quite ready to say goodbye just yet. 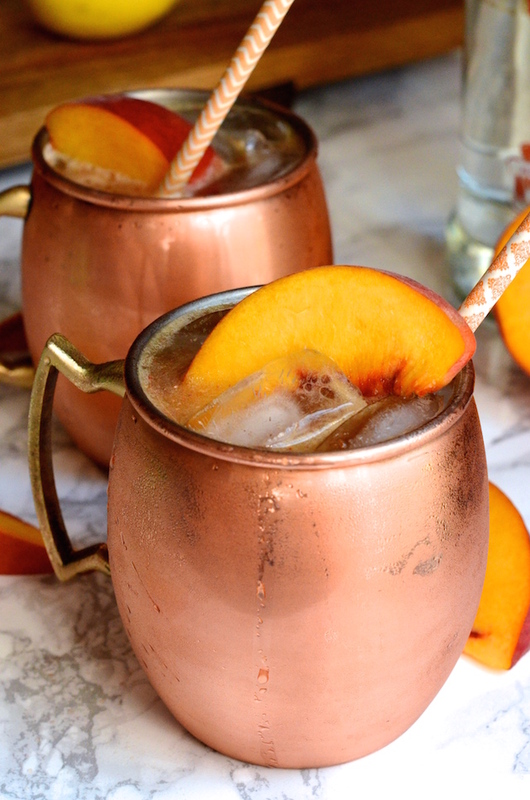 Hence this perfectly timed Ginger Peach Moscow Mule cocktail! Juicy and ripe peaches meet the warm Fall spiciness of ginger in this perfect end-of-summer cocktail. It's the best parts of summer and fall combined into an easy and crowd-pleasing drink. I can honestly think of no better drink to serve during your Labor Day celebrations. 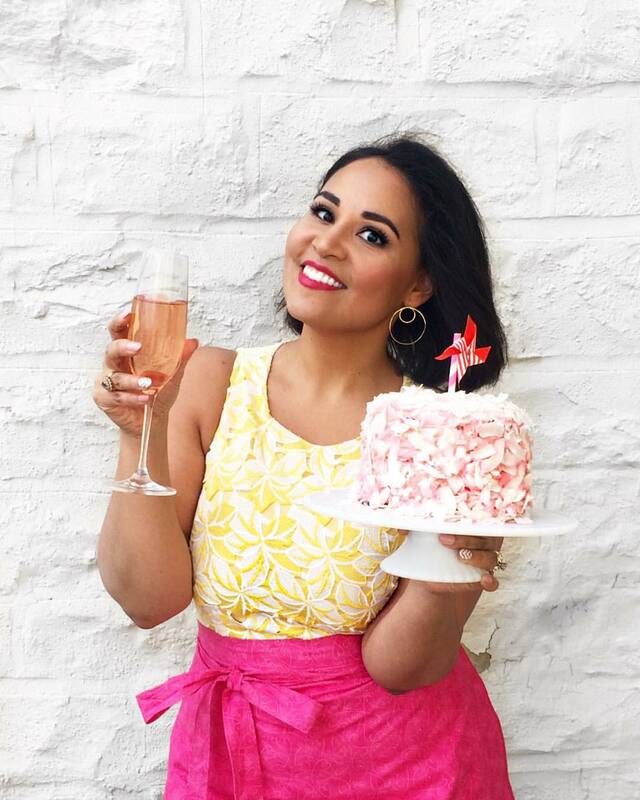 As you may know, I partnered with Smirnoff this summer to share a series of fun and easy vodka punch recipes for your summer parties. As we wind things down and start preparing for Labor Day and the arrival of Fall, I thought I'd mix things up with a summery twist on a classic Moscow Mule cocktail. Have you ever had an original Moscow Mule? I absolutely love them. I tried them for the first time about 10 years ago at a fancy bar located around the corner from my first apartment after college. I remember loving that mix of spicy ginger beer and cool, crisp vodka. This fruity late-summer twist on that classic adds homemade peach puree and a hint of spicy fresh ginger. It's the perfect way to bid farewell to summer! 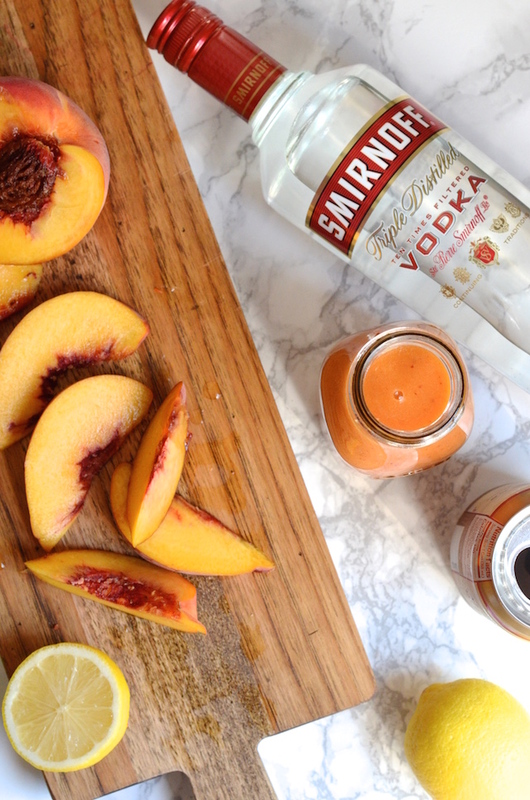 For more fun cocktail recipes and ideas, follow Smirnoff on Instagram and Facebook, and check out their fun party boards on Pinterest! 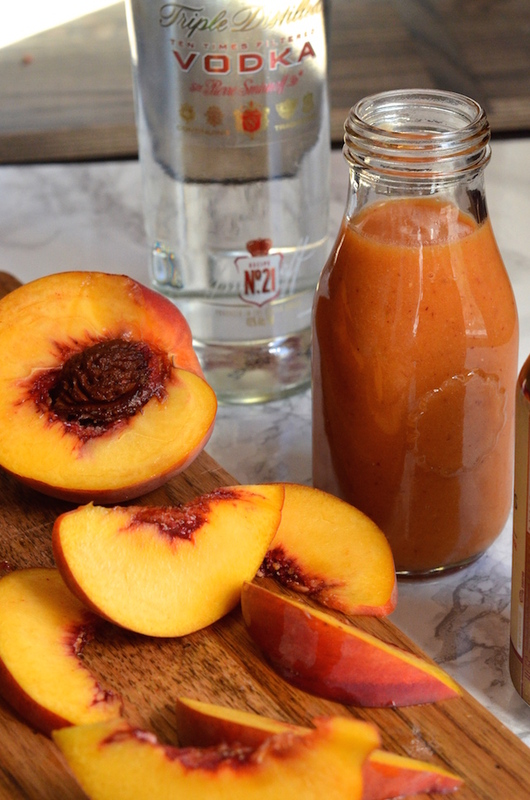 Make the puree: Cut the peaches in half and remove pit (do not peel). Slice the peaches, reserving four slices for garnish. Combine the rest of the peach slices in a blender with the peeled ginger root, lemon juice, and water. Puree until very smooth then strain through a fine-mesh sieve, discarding any solids and keeping only the smooth puree. To make the cocktail, combine 1 cup of the puree with the vodka in a large shaker filled with ice and shake until frosty. 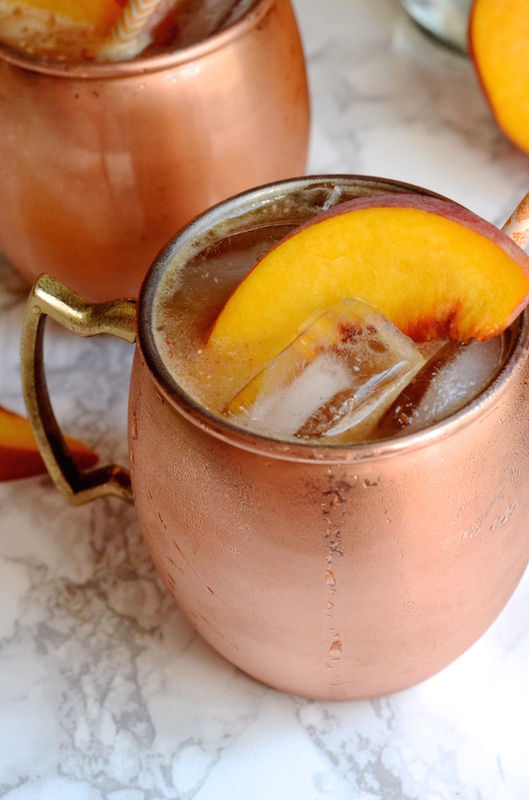 Divide the peach and Smirnoff vodka mixture evenly into four Moscow Mule mugs or cocktail glasses filled with ice. Pour 1/2 cup ginger beer into each mug. Garnish with a lime or lemon wedge and a fresh peach slice.